2048 Game - TIps To Make a 2048 Tile Easily & Quickly! 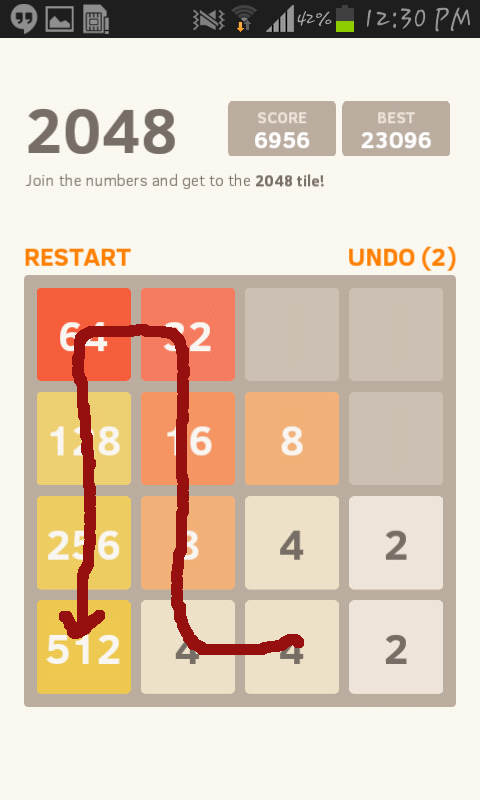 So, You got addicted to 2048 and wondering how to make 2048 tile? As long as you don't know the strategy its a nightmare. Once you know that, its pretty easy and I bet you can make 2048 tile every time you play a game. Sounds good? Lets get started. Warning: This is How I play the game and I can make 2048 tile every time I play this. Now, lets look at the game a bit differently. Its very tedious( and time consuming ) to look at all 16 tiles for each and every move we make while playing the game. Actually we don't have to. Take a look at the pictures below. The Goal - The tile where 2048 will be formed. The Path - A few tiles which we will use to make goal. Now don't worry much about the remaining tiles. How To Make 2048 Tile? 2. Move the first tile to the goal position and keep adding remaining tiles to this. 3. Do not move the goal tile unless you have no other choice. 4. DO NOT MOVE THE GOAL TILE UNLESS YOU HAVE NO OTHER CHOICE. 5. Move the next tiles to path in DECREASING ORDER ONLY. 6. Make sure the goal is always the biggest tile and tiles in the path must be in decreasing order. 7. Go on adding the tiles in the path to the goal. 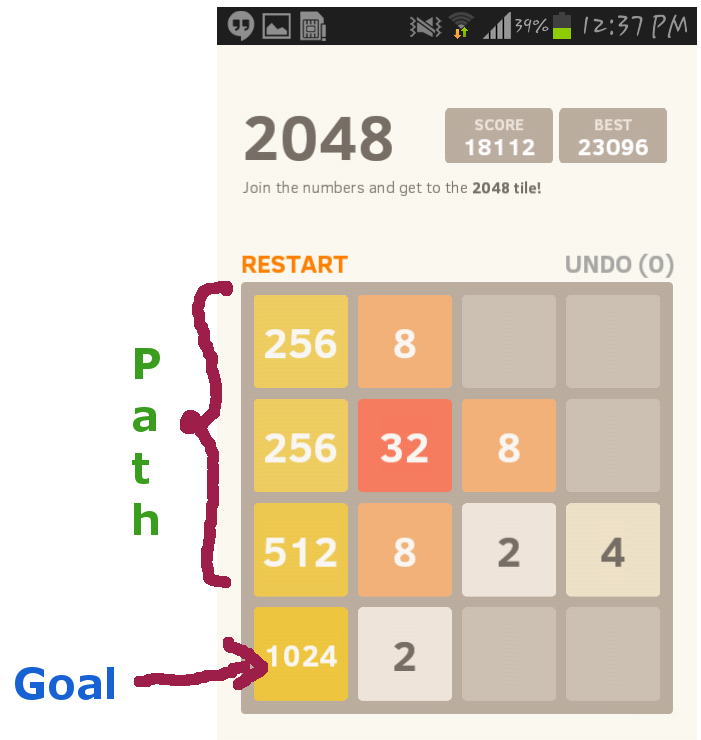 If you follow the above rules and play the game a few times You will make 2048 tile easily. Good luck. 1. Instead of pushing tiles around stick to 2 swipes only. While I play the game, I swipe from top to bottom and right to left only. If these two are not possible then I swipe from top to bottom or left to right depending up on the tiles. 2. Always keep the high valued tile in bottom left and keep adding the remaining tiles in descending order from bottom to top as shown in the figure. For Geeks: If you want to solve 2048 programatically check this Stackoverflow Q & A. Check this video on how to make 2048 tile!